In July 1518 an unusual plague spread in the city of Strasbourg. Caused by a woman dancing feverishly in the middle of the street. She went on for days, infecting other people. Within a month 400 individuals were frantically dancing along. Historical articles describe the phenomenon as something similar to ‘mass hysteria’ or ‘demonic possession’. The people affected with the ‘illness’ appeared to be in a state of semi-unconsciousness; they didn’t pay attention to their bleeding feet, didn’t feel any physical weariness, so much so that some of them died of fatigue. I wonder what kind of music they were dancing to. I’ve seen something akin to dancing plagues myself – in fact, I‘ve experienced it. One of the first memories I’ve got as a child dates back to when I was five. I was dancing wildly on the coffee table in the living room. I had a white lace bodysuit on, which was perfect to exercise in, but very annoying when I needed to pee. Queen’s Greatest Hits II album was on. I threw my arms in the air and jumped, leaving prints of sticky feet on the shiny table surface. I twirled madly and defiantly. I remember the feeling of satisfied exhaustion when the record ended, as well as the warmth and the sweat which glued my dark, curly hair to my neck. I was always a relatively tranquil girl. It was hard to tell from the outside how I felt because, even though unconsciously, I didn’t let my inner world percolate and show itself publicly – except when I danced. I have this image of my mum watching me through the glass doors, smiling. The music I danced to varied. When my brother was around, he picked the tune. Sometimes he even made the music himself. He placed pots and saucepans on the sofa and banged randomly on them with wooden spoons. I didn’t mind as long as the coffee table was all mine and I could spring and pivot as feverishly as I wanted. In his book ‘The Element’, Ken Robinson defines passion as an occupation allowing you to lose track of time and space; enabling you to reach a sort of bliss, to forget about everything – including yourself. That’s what dancing felt like. In my life I’ve tried countless dance classes or dance-related sports. I started with ice skating, then ballet. I tried artistic gymnastics and ended up doing rhythmic gymnastics. Later on, I attempted belly dancing and contemporary dance. In my twenties, I went through a partner-dance phase. I chose the Brazilian ones: samba de gafiera and forró. I stumbled across Argentinian tango, which was one of my favourites, together with Afro-Brazilian dances. But what I discovered after all these experiments is that I’m not so keen on following rules when it comes to movement. The place where I could best unleash my inner dancer as I intended was on the dance floor. I started off with more (or less) legal rave parties during my teenage years. The music was mainly drum and bass or techno frenchcore. Then I began to hang out in leaking basements, squats and abandoned theatres. There, the music was faster and darker: speedcore, breakcore, noise. Only a few years ago I entered the ‘institutionalised’ club scene. In one of these techno venues I had my first collective dance affliction. 2am: the sun was far from rising, yet inside the club was possibly darken than outside. My eyes needed a couple of seconds to adjust. The walls had a slick sheen as if they, like the people walking past me, were sweating pearls. I followed the muffled sound of the speakers through the entrance. Lights flashed intermittently from somewhere I couldn’t quite discern. Pale men leaped out from dingy corners, like the ghosts in Pacman. I looked around me impatiently, stunned by the unexpected glimmers and eager to see more. I’d have liked to explore the concrete maze properly, but the music had grabbed hold of me and was pulling me toward it. On the metal stairs, the sound of my feet stomping was drowned out by almighty bass beats. I reached the first storey, then I was really in, amid what looked like a swarm of epileptic, black cockroaches. I zigzaged between them to find my spot, bypassing the glossy eyeballs and gurning mouths. Everything hit by the spotlights seemed to be sheathed in artificial wetness. It made me think about the precogs in Minority Report. The vibrations spoke to my organs, commanding them to move – and so they did. The music kept calling me closer to its source and I followed it blindly, brushing past bodies which didn’t feel as if they were made of flesh. Hair like soft antennas tickled my shoulders as I passed through the crowd. The air was thick with decibels, nailing me to the floor. Strobe lights tricked my pupils into contracting and expanding, spasmodically revealing more corners, more stairs, more white eyeballs. I couldn’t do anything but execute what the master of the house ordered me to do: dance, dance, dance. So did everybody else. No chit-chat, no flirting, just limbs jerking rigidly, feet stepping fast, heads bouncing and nodding. All together in uncoordinated unison. I wished I could watch us from the ceiling, bet we looked like a buzzing electric wave, an overexcited ECG. I was suddenly aware that what I thought of as ‘I’ had become ‘us’. I danced for eight hours, non-stop. Feet, knees, thighs and glutes performing smooth moves I didn‘t choose. Hips, belly and chest fluctuated along. Shoulders alternately rotated, arms swirled and hands shaped invisible sculptures. My eyes were open or closed, it didn’t matter. Nothing mattered. Hypnotic music has been associated with human rituals since the dawn of time. Drums were played in predictable, fast, rhythmic patterns before hunters went off to fulfil their duties, to change their mental status, pain threshold and emotional processing. It worked because music affects our brain biochemistry. Studies of brain activity while people listen to music have shown, among other things, how brain waves change and which hormones are released into the blood system. In relation to techno music, it has been observed that the levels of several hormones actually rise. Both ACTH, an opioid neurotransmitter, and cortisol, also known as the ‘stress hormone’, increase when techno music is being listened to. The concentration of noradrenaline also rises. This neurotransmitter activates the sympathetic nervous system, and, together with epinephrine, triggers the fight-or-flight-response (although epinephrine levels are not affected by listening to techno music). An increased amount of such substances leads to a higher state of alertness and a greater psychomotility. Growth hormone and beta-endorphin levels also rise, and are responsible for an improved mood and energetic tone. Techno music increases heart rate and systolic blood pressure, while focus, memory and concentration ability decrease. The changes observed in brain waves show that beta-waves, which are related to stress, and q-waves, related to hypnosis, become partial substitutes for alpha-waves, which are related to being in a relaxed state. Emotional responses to these changes in hormonal concentrations vary according to the personality traits and temperament of the listeners. A study conducted by G. Gerra, A.Zaimov, G. Santoro and G. Moi revealed that those categorised as ‘harm-avoidant’ on the Cloninger scale rated the techno experience negatively, whereas those categorised as ‘novelty-seeking’ rated it positively. In light of these facts, the dancing plague of 1518 looks less mystical. Historian John Weller explains in his book, “A Time to Dance, A Time to Die: The Extraordinary Story of the Dancing Plague of 1518”, that the event not only undisputedly took place, but also how it originated. 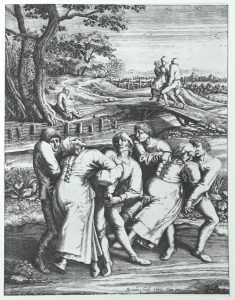 Weller maintains that the so-called ‘crazy dancing’ is the consequence of a stress-induced psychosis. At that time, the region was suffering from diseases and epidemics such as syphilis and smallpox. The population was affected by famine and many families were wiped out by starvation. People were constantly living in a state of crisis. The conditions were potentially made even more oppressive by religion and superstitions. One of those superstitions, Weller says, originated from the Christian Church and claimed that if anyone provoked the wrath of Saint Vitus – a Sicilian martyred in 303 A.D. – he would send down ‘plagues of compulsive dancing’. People’s stress levels were so high that they apparently transformed into mass psychological illness. Something similar still happens today, but with a different cause-consequence relationship. Perhaps one of the reasons why people go ape on the dance floor is so as not to ‘lose it‘ in real life. We live under ever-present pressure: deadlines, expectations, ambitions, standards and rules, taunting us day by day. ‘Work!’, ‘Be successful!’, ‘Settle down!’ are imperatives which constantly echo in our minds. And the effort we put into reaching the goals society has set for us is often fierce and all-consuming. We must achieve, we cannot fail. This is a boulder set down on our shoulders and we all are tiny Atlases. How do you not get crushed by their weight? How do you shake them off? This scientific explanation takes away a bit of the romance upon which I had built the theory that the amalgam of atmosphere, people and music brought me close to a trance-like state, where I didn’t feel any physical pain or tiredness, where the energy I felt seemed to have sprung, effortlessly, from the perfect cohesion of being in the right place, mood and sound; giving me superpowers. But, nonetheless, I still feel the same: when I’m on the dance floor I erase myself and the world. Nothing exists besides what is sensory. I cannot even feel pain. I can’t remember the past, can’t plan for the future. My hopes and worries disintegrate under the merciful thud of bass. Thoughts don’t acquire shapes or language, but are instinctive: move, dance, hydrate, move, dance, smile. I am no longer me; no longer a civilised human being, but an undefined entity compelled to follow the beat. Deprived of any choice, my mind finally shuts down and my body takes over. It is in charge now. There are no demands from my ego, no rumination; only intuitive reactions to the primordial stimulus of low-pitched, repetitive sound. Any rational reluctance perspirates out of me. The ‘I’ is not a subject anymore but a particle of a greater, rhythmic organism. And we are not afflicted by dance, but healed through it. 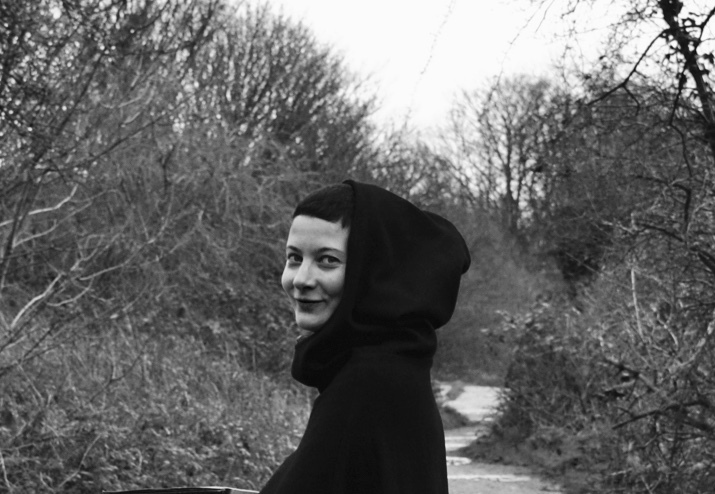 Paola Moretti is currently a student of the MA Creative Writing at the Birkbeck University of London. Woman of misplaced homes Paola has lived in Pescara, her home town, Lisbon and Berlin. In the latter she studied modern languages at the Freie Universität and worked as a contributor for magazines and as a book seller. She has a keenness for gloomy, poignant poetry, which she loves to read on her sofa, wherever it might geographically be.